British space company OneWeb has secured a further $1.25 billion (£940m) in new funding to support their plans for launching a massive constellation of compact low-latency ultrafast broadband satellites into circular Low Earth Orbit (LEO), which takes their total investment pot to $3.4bn (£2.57bn). The first six (OneWeb F6) of their spacecraft were launched last month (here), while today’s funding announcement means they can finally “start mass production” on the rest and get the full commercial network live by the end of 2021. 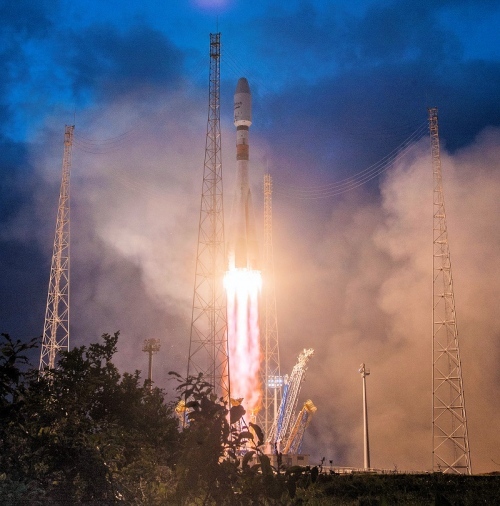 OneWeb will now “embark on the largest satellite launch campaign in history“. Starting in Q4 2019, they will begin monthly launches of more than 30 satellites at a time, creating an initial constellation of 650 satellites to enable full global coverage (adding more in the future as demand requires). Each satellite, built by joint venture partner Airbus, weighs around 150kg+ and is roughly waist high (with solar panels folded-in). In theory these could deliver latency times of around 25-35ms (similar to an ADSL based fixed line connection) and “ultrafast broadband” speeds of 100Mbps+ (peak speeds of 500Mbps have been mentioned) to consumers, but it remains to be seen how this pans out in reality. The satellites communicate with Earth via the Ka band (20-30GHz) and Ku band (11-14GHz) spectrum. The Ka-band will be used for communication between the Ground Network (connects the OneWeb system to the internet) and the satellites, while the Ku band will be used for communication between the satellites and the end-user terminals that deliver internet connectivity to consumers. “This latest funding round, our largest to date, makes OneWeb’s service inevitable and is a vote of confidence from our core investor base in our business model and the OneWeb value proposition. With the recent successful launch of our first six satellites, near-completion of our innovative satellite manufacturing facility with our partner Airbus, progress towards fully securing our ITU priority spectrum position, and the signing of our first customer contracts, OneWeb is moving from the planning and development stage to deployment of our full constellation. OneWeb claims their new network will “provide services to billions” of people across the globe and support the emerging digital economy, as well as advanced mobile application needs. To support the deployment of this system they’ve also setup “high-tech satellite operation centres” in both Virginia and in London, and have installed ground stations in Italy, Norway, and Canada, with more on the way. The company believes that they now have a “clear first mover advantage” over rivals that are attempting to launch similar constellations, such as SpaceX, although we’ll reserve our own judgement until we see the first package details and prices. Much will depend upon how those first services perform and how competitive they are with the huge GEO Stationary Orbit (GSO) comms satellites, which adopt are much more distant orbit around the earth but suffer from slow latency, poor speeds at peak times, high prices and limited data allowances. The latest funding round was led by SoftBank Group Corp., Grupo Salinas, Qualcomm Technologies and the Government of Rwanda. If their plan for full global coverage by end of 2021 is achieved, this could still deliver a better broadband service than my copper pair from Openreach. I’m intrigued to know at what sort of price this will be pitched at, it could be a good solution if priced appropriately. What’s the real experience? The latency statement appears to defy the physical distance. The orbit of the satellites is only 1,200km, so nothing like the 36,000km of a geosynchronous orbit. Latency should be low.